Flax seeds are healthy oil seeds which are rich in fiber and omega 3 fatty acids. They also have lignans which provide anti-oxidants. 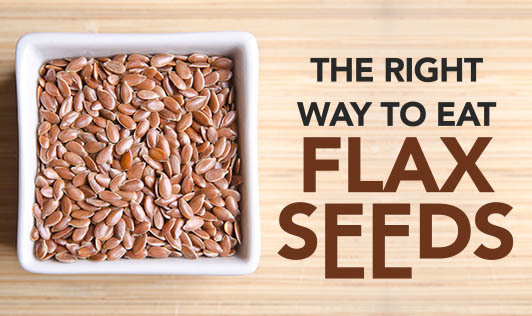 However, to get the benefits of flax seeds, it has to be eaten in a particular way. Flax seeds are available in whole and ground forms. Flax oils are also available. The best way to eat flax seeds is in its ground form. This is because the fiber from the seeds are absorbed more efficiently when they are ground. There are 2 types of fiber in flax seeds: soluble and insoluble fiber. Soluble fiber dissolves in water and forms a gel in the stomach making you feel full. It also slows down the process of digestion. Insoluble fiber adds bulk to the stools and makes bowel movements easier. When flax seeds are eaten whole, they only provide insoluble fiber and are eliminated from the body without being digested. So, the omega-3 fatty acids, lignans, soluble fiber and the nutrients found in the seeds will not be absorbed or utilized by the body. Flax oils provide omega-3 fatty acids and lignans, but do not have fiber. So, ground flax seeds always make a better choice! You can add it to your yoghurt, breakfast cereal, baked product etc to give a nutty flavor and to increase the fiber content.